Many viruses have evolved altrnative ways to initiate viral mRNA translation.The reason is either that the virus shuts off classic host translation, or because the viral RNAs are non-classical, missing a cap or polyadenylation. Internal Ribosome Entry Site (IRES) are RNA structures that allow cap independent initiation of translation, and are able to initiate translation in the middle of a messenger RNA. Cripavirus IRES also allow the translation initiation on a Alanine or Glutamine tRNA. 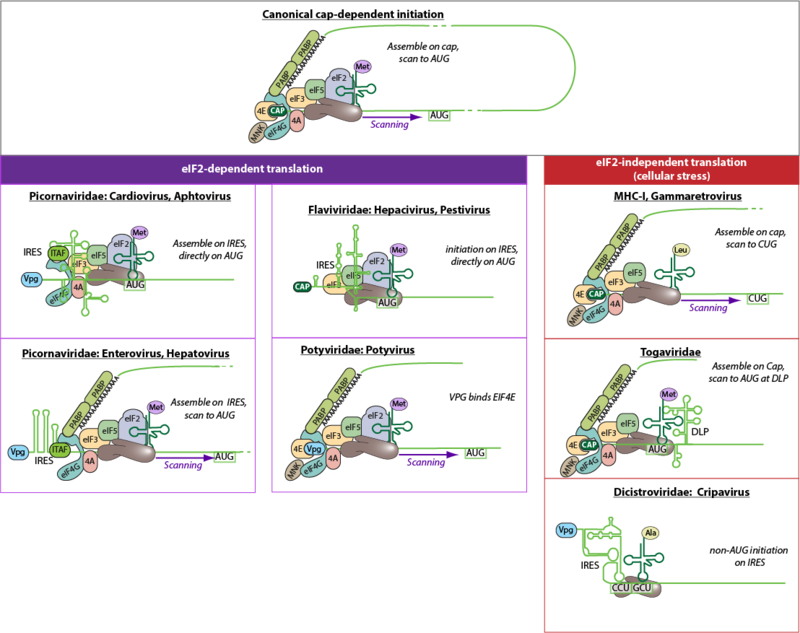 Downstream Hairpin Loop (DLP) are RNA structures that allow initiation of cap dependent translation in the absence of eIF2 initiation factor, where the initiating methionine tRNA is placed by the DLP structure on the ribosome. CUG initiation involves initiation with a leucine, and is more likely to occur upon stress with eIF2 inhibition .